Venting her anger against Asaram Bapu, the 16-year-old girl, who has accused the self-styled godman of sexual assault, on Monday alleged that he is “a criminal in the garb of a guru”. “It was a big mistake. The day I met Asaram at his Jodhpur ashram was the worst day of my life,” she told the media at her residence in Uttar Pradesh‘s Shahjahanpur district on Monday evening. The girl mustered some confidence and agreed to speak to a section of the media after she found out that Asaram has been sent to judicial custody. “I hope my best and brightest day will come soon. 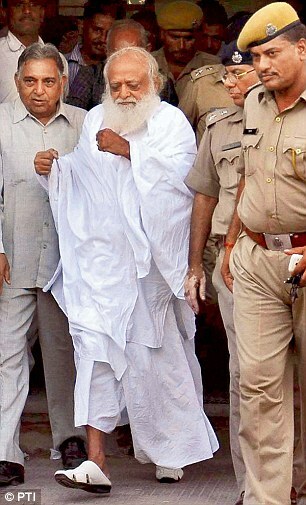 I want to see Asaram undergoing punishment. This guru shouldn’t be allowed to interact with children,” she said. The minor has apparently confided in her mother after she returned to Shahjahanpur on August 16. “We didn’t realise that Asaram is a demon. We were blinded by faith,” the complainant’s mother claimed. According to the complaint filed by the family, Asaram sexually assaulted her for more than an hour inside a room in his Jodhpur ashram as her parents sat outside chanting prayers for the “ritual” her daughter was supposed to be undergoing. “Asaram went into his room around 10pm and called my daughter inside for some pooja. After an hour, he asked her to go out to check if we were still waiting. She came, saw us and went back. When she returned after a while she was shivering. This guru shouldn’t be worshipped,” the mother told reporters. Meanwhile, a Delhi court has put off the hearing on Asaram’s bail plea till Wednesday. The 72- year-old was sent to 14 days’ judicial custody on Monday. A few years ago, he bought land in Shahjahanpur and constructed an ashram for Asaram Bapu. But the father of the 16-year-old girl who claims Asaram abused her now regrets blindly worshipping the godman. On Tuesday, he charged that he had been facing death threats from Asaram’s henchmen ever since he filed an FIR against the self-declared guru. “Asaram’s henchmen are mounting pressure on my relatives in Delhi, asking them to prevent me from pursuing the case. The goons said several generations of my family would be eliminated if I don’t keep mum on the issue. I’m ready to die but cannot spare this demon whom once I worshipped as god,” he told Mail Today on Tuesday. Meanwhile, the police have arranged security for the complainant’s family. “A sub-inspector and four male constables and two woman constables have been assigned to provide security for the family,” Shahjahanpur SP Sayed Wasim Ahmad said. In an indirect reference to the drama over the arrest of self-styled godman Asaram, a Supreme Court bench observed on Tuesday that it was amazed to see on TV such a huge number of police officials around an accused. “These people begin as drug peddlers and then go into politics and religion and acquire massive wealth,” the bench presided over by Justice G.S. Singhvi said, while adjourning the hearing of a matter pertaining to VIP security and misuse of beacon lights.